Bangalore is a hub for many things, however, there is one thing that cant be missed! Yes, we are talking about the fun options we have in this beautiful city. Apart from various entertainment options, one can indulge in great picnics in and around Bangalore. To help you out with the best ones, here is a guide for popular picnic spots in Bangalore. The vast Big Banyan Tree- Dodda Alada Mara, is a short drive away from the city. It covers an expanse of three acres and is about 400 years old. Pack your basket, stuff it with snacks and grab your favourite book or board game and enjoy the marvel and cool shadow of the large tree. Situated behind the Bannerghatta National Park, Muthyala Madavu is an ideal locale where water and lush greenery merge to form a sight for sore eyes. Translating to a “Valley of Pearls”, it gets its unique name from the sight of the gurgling and gushing waterfall which falls over the rocks like a string of pearls. The waterfall is located amidst a mountain range and the tranquil surroundings serve as a perfect spot to spend a peaceful day. The place owes its popularity to the cult classic Sholay, as the movie was shot here. But dotted with rocks and boulders, this place is the perfect spot for cave explorations, trekking or any rocky adventure to set your adrenaline rushing high. Take the Mysore road to get there faster and spend more time. Home to one of the largest monoliths in Asia, the place has the two best trekking destinations- Kariguda and Billiguda. A drive on the weekend will wake you up to embark on a trek to the hills which offer a serene atmosphere, a splendid view and ruins of a fort at the top. A dam designed by Sir M Vishweshwray, fenced by the Savandurga Hills is an anthropologist’s delight. The waters offer a source of adventure sports like raft building, rappelling, kayaking and the view of the sunset is bound to leave you breathless. Undoubtedly one of the best Picnic Spots in Bangalore, the five hills that surround the place is popular for hiking, trekking and rock climbing. Notably reputed for the silk and incense industry, Chikkaballapur offers several avenues for the one-day break you are looking for. An absolute delight for history buffs and trek lovers, the place is a memorable drive down the NH7 route. Witness ruins dating back to the 18th century and if you are the nocturnal being, then indulge in midnight adventure treks to add a star to your trekking escapades. Nandi Hills is well-known as one of the prominent picnic places in Bangalore just beyond the airport. It houses the ancient fortress from the times of Tipu Sultan, revered temples, a palace in ruins and a lake. The fortress is famous for trekking, and the hills around the place serve as a perfect spot to view the breathtaking sunrise and sunset. Take the climb, spread your blanket and picnic basket to let the panoramic view unfold in front of your eyes. If you have kids and want to spend a day out with them, then head to Channapatna – “Toy Land of Karnataka”. Apart from the famous toy industry known for its sculpted toys painted in natural dye, the place is also home to one of the oldest temples of Varadaraja. One can experience the grandeur and splendour of the Vijayanagar Empire here, and it is a great educational outing for kids about history. Anthargange is an unconventional hill range in Bangalore interspersed with a lot of caves formed by rocks. It derives its name from the perpetual spring that flows from the rocks amidst the mountains. 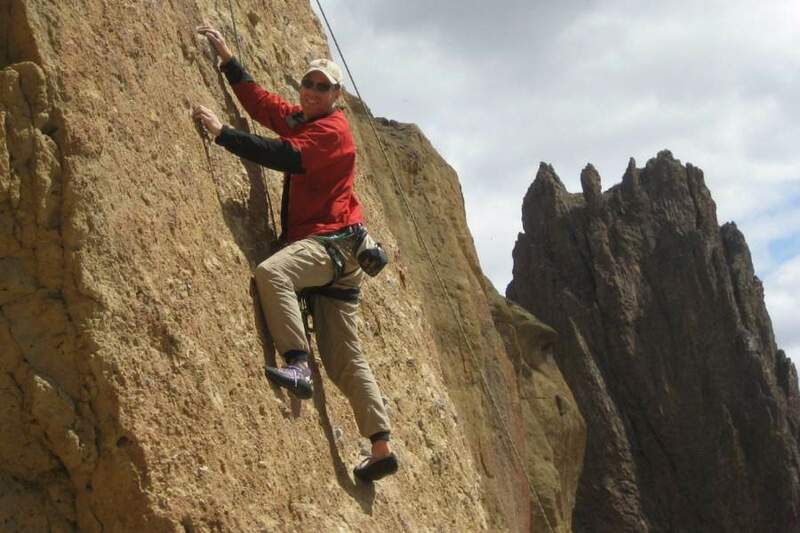 Those seeking thrill can indulge in a trek, rock climbing and even exploring the caves. Not spoilt by packed tourists, there is a lot to unearth in this place, and it is the best haunt to spend a day in peace and tranquillity in the lap of nature. Chunchi is the answer to a day you want to spend with nature. It nestles a 100 feet waterfall with several tiers, falling gracefully to form a swimming pool at the bottom. Unwind, let go and connect with the soul of nature. An unconventional place to spend a memorable day with loved ones or even alone. Avani offers best of both worlds in a day trip. A preferred destination for rock climbing, this village in Kolar is famous for the temple dedicated to Goddess Sita. The architecture of the temple is very Dravidian. As it is not known to many people, the place offers a calm and soothing atmosphere with no crowd and chaos. Sangama is where one can witness the confluence of the Arakavathi River and Cauvery River. About 2.5 km away, Mekedatu is where the Cauvery River flows between a deep and narrow gorge. The rocky areas on either side make for a scenic location and an apt spot to spread your picnic basket. Isolated and away from the hustle and bustle of the city, Sangama and Mekedatu are the perfect choices for quick-day picnic spots in Bangalore city. Amongst the off-beat, one-day picnic spots in Bangalore, Bheemeshwari is a nature lover’s delight. 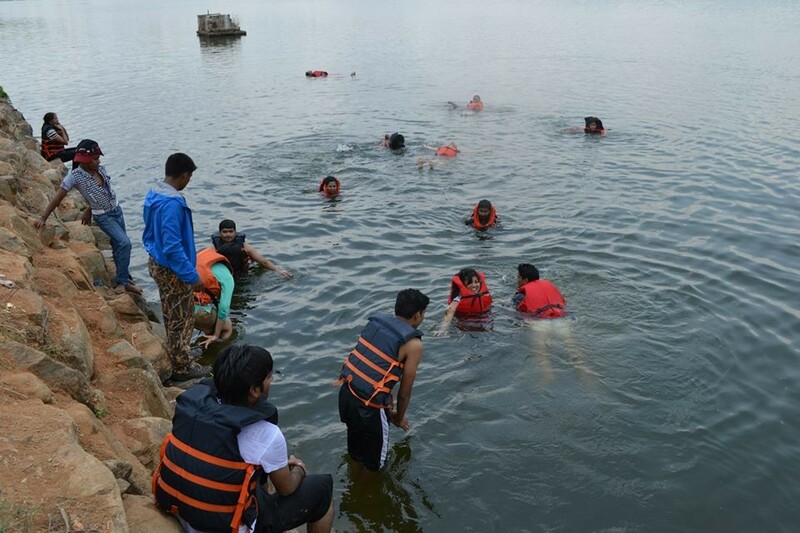 Situated amidst dense forests along the banks of river Cauvery, Bheemeshwari is for those seeking adventure in a day. There are a host of activities for adventure enthusiasts, like mountain biking, kayaking, trekking, boat rides and fishing. Bheemeshwari is home to different species of birds and animals and offers ample opportunities for photography. The “Niagara of the East” Hogenakkal boasts of cascading waters enveloping the flora around it. 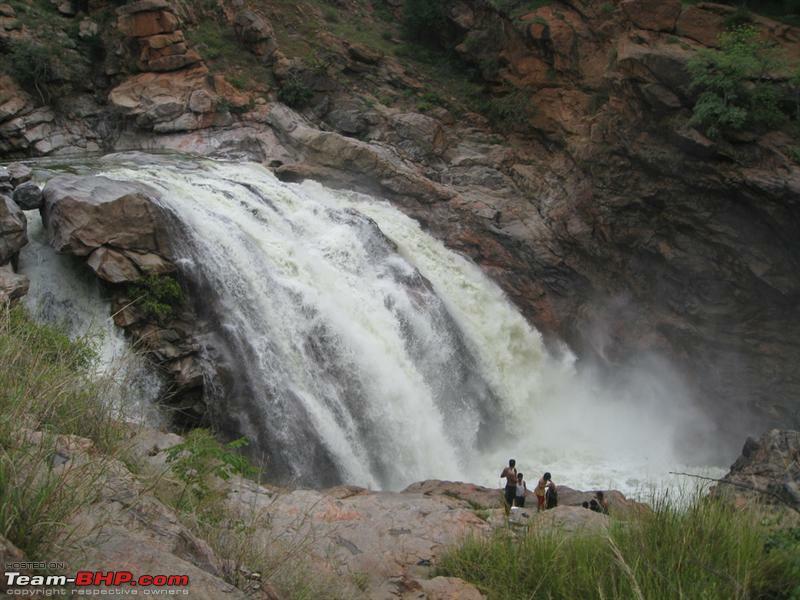 The Cauvery splits into multiple streams and cascades into gushing waterfalls at this location. Hogenakkal is famous for its coracle rides. The place has been the shooting spot for many famous movies like Roja and Raavan. Melagiri Hills located close to the falls offer a soothing sight and spot to relax and reinvigorate. The water is known to be infused with medicinal properties, and the carbonite rock formations are a rare sight in Asia. Rekindle the anthropological spirit in you and reward yourself with a visit to the Ranganathittu Bird Sanctuary especially during the winter months. Spot ibises, pelicans, storks, herons, egrets and partridges in unison with nature. A ride on a precarious coracle could help you focus and spot these winged beauties at their soaring best. The sanctuary is home to crocodiles and otters too if you have a fetish for the aquatic reptiles. Revel in the gurgling water flow of the dam across the Cauvery River and take a stroll down the green expanse around the dam for a perfect picnic with the family. A perfect spot for a day with family, a visit to these beautiful waterfalls. One among the quaint picnic spots in Bangalore, Horsley Hills is virgin in beauty and offers a stunning view of the hill ranges of the Eastern Ghats. A collection of deciduous forest, dense trees and woods, Horsley Hills is an idyllic location to soak in the lush scenery and vantage viewpoints for a feast to the eyes. The Biligiriranga Hills, or better known as the BR Hills are located between the Western and the Eastern Ghats. It has flora and fauna of both the Ghats. The BRT Wildlife Sanctuary is a habitat for several species of animals and birds and also a haven for the nature enthusiasts. Those seeking moments of peace and calm could seek refuge under the “DoddaSampide Mara”, which means “The Big Champak Tree”. The site holds spiritual values and is almost a thousand years old. If you love history and want to soak in a slice of it, head to Talakkad. A ghost town steeped in history and covered in dunes lies in careless abandon housing opulently and intricately carved, lavish temples. Travel around 135 km from Bangalore to experience a tryst with a history that is buried or to be at the epicentre of horticulture and winemaking. Once a ghost town, this tiny, sleepy hamlet is also home to winemaking and diverse culinary practices. Places in and around Bangalore offer a wide palette to spend a quiet day out with family and friends. The above list is cherry-picked for you to earmark your holiday calendars, make sure your long weekends are well planned and guarantee nothing short of fun and frolic! Don’t forget to share your story with us on visiting any or all of these cool picnic spots in Bangalore.